Dogs are motivated by food, and training them properly takes a lot of dog treats. What many owners don't realize is that the calories in all of those treats add up fast. 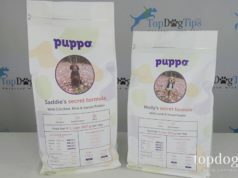 Liquid treats, like this one from Trixie Pet Products give your dog the same reward without all the added calories. The convenient roll-on bottle is easy to carry in your hand or pocket and your dog can lick his reward easily. The tasty liquid snack has no added sugar and the dog treat comes in chicken, salmon, or beef flavor. When your dog deserves to be praised, you simply unscrew the cap of the Roller Pop Trainer Snack, and let him have a few licks. It lasts as long as a chewable snack and the licking itself is a pleasure for dogs, which increases the reward effect.